Roots University College presents Islamabad Campus Summer Bash, live with Jal! 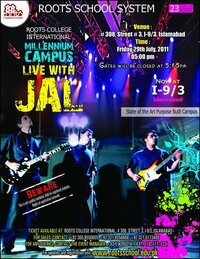 Tickets are available at RCI, 36 Nazimuddin Road, F-7/1, Islamabad. The event is open for all. Non-Rootsians are also allowed.